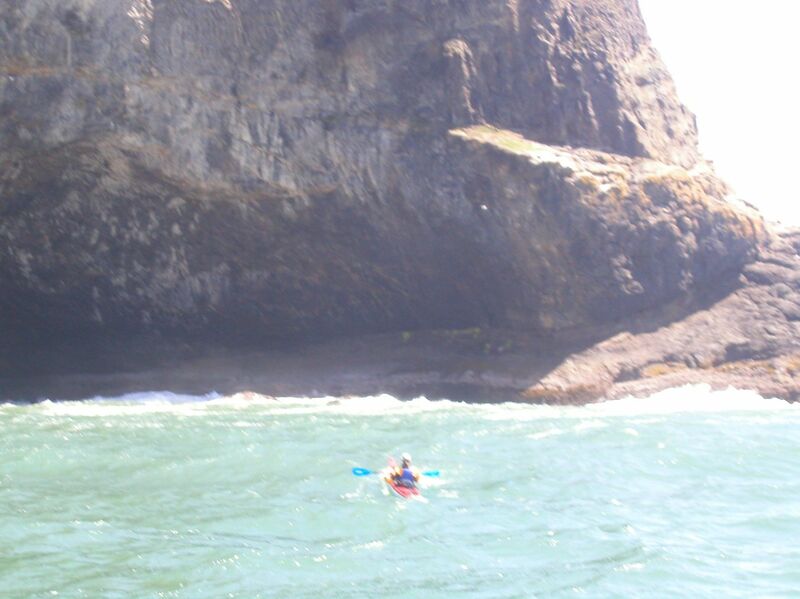 This is mostly cliffs with steep hillsides at the base of the cape. It seems there is some new slide somewhere on the hillsides, but this time there was a small collapse at the base of the cliff on the south side of Well's Cove with a small debris pile and several large blocks roughly square shaped with about 10 X 10 ft. sides. This would be along the path that someone would take bush-whacking to the cove, which is occasionally done. I doubt that it was caused by people and saw no sign of a trail up the gully from this slide. It's been quite a while since I visited here, and it felt like visiting an old friend. After unsuccessfully trying to get other paddlers here, I ended up going solo again, which gives a much more intimate experience of place. And what a place this is!I've had some inquires about paddling here and want to express the seriousness of this. Basically, a high cliff finger that jets out this far doubles wind, current, and hugely confuses the sea around it, at least near its tip. The forecast was for extremely low swell/surf and winds to 10 mph. But I encountered frequent larger sets of waves on launch and was surprised to be back surfed by one. While the wind was just over 10 mph on the beach, it was 25 mph at the tip. The swell and wind waves compressed to peak to over head height while rounding the cape. These rebounded off the cliffs to head out to sea against the incoming waves, and all of this while going against the wind at a bouncy crawl. I only go here in the best of conditions and while I have seen easier paddling this is the norm.While cautioning paddling here, I would also like to enlighten anyone attempting this during nesting season. The south side has great nesting for murres, but they are easily disturbed, Stay well away during this time as opportunistic gulls hang out above nesting gulls. On this day the cape looked good. I saw quite a few sea stars, mostly large juveniles, I think. I saw none of the usual sea lions or pelicans at the tip. This may be due to it being fall, but I always use to see them and am concerned by seeing fewer sea lions at other locations, such as Cascade Head's Wells Beach. There is a new cliff collapse on the north side of Well's Cove with large junks resting on a ledge just above the water.There is much less human debris than normal on the few collection zones. The beach fronting the large shallow cave in Well's Cove was especially pristine. I've seen piles of commercial fishing equipment and regular flotsam there in the past. All looked well - particularly with seemingly more numerous and healthier looking birds. No erosion noted. 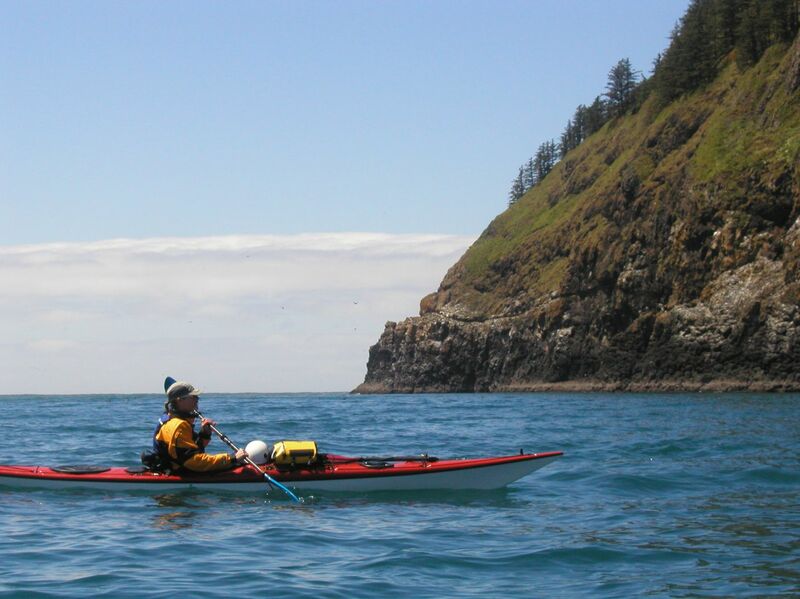 Rough conditions and more birds kept our kayaking farther off Cape Lookout.